This was a great adventure and we loved every minute. There is a 2 meter distance you are required to maintain between you and the wildlife, however no one explained this to the animals so be prepared for some amazing up close encounters. This ship is a great choice for teens through active seniors without mobility issues. Although it was not a problem for us, if you're prone to motions sickness come prepared. 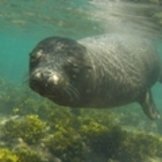 I was in the Galapagos in 1993, it is still very similar to my 1st trip 25 years ago. You will not be disappointed, bring good walking shoes (or hiking boots) and be prepared to walk on lava rocks in some areas. The ship did provide walking sticks if you need one. Bring a great zoom lens, you will be thrilled if you buy a 60x zoom. Be prepared to take LOTS of pics, everything is a picture opportunity. Be in the moment and enjoy nature. Thank goodness the wifi is very slow on the ship it really makes you unplug. It is really too bad that Celebrity is moving away from the 16 person ship. We had 6 of our friends with us so we felt like we had our own charted boat. Even if just a couple, you will feel that way. We knew all the crew quickly and they knew us as well. I would definitely recommend Celebrity for the Galapagos. I don't see how another company (i.e. Lindblad) could do much better. Seems like it was a bit cheaper also. If you choose to follow Celebrity Xploration you will receive weekly email updates with the latest reviews, tips, and photos from Cruiseline.com members about Celebrity Xploration.